They say sound travels far over water. For the placid, dormant waters of Underdark that old trivia proved to be remarkably correct. I had been hearing the splashes of oars for minutes, before a small, flat-bottomed vessel glided out of the inky darkness and rowed close to the muddy shore. Four svirfneblin jumped into the knee-deep water, securing the boat and its cargo. Greenberyl greeted us from the stern, but did not hurry to disembark. Instead, two sturdy deep gnomes carried him to dry ground, together with his baggage. "Jolly good seeing you all again," the flamboyant creature beamed at us above the green lenses of his flashy spectacles. His salmon-pink robes were covered with a long cape of purple velvet. A wide-brimmed hat of black felt, decorated with a long purple feather completed his outfit. I had seen him in his humanoid form before, but the peculiarity of his tastes never failed to amuse me. "Light a fire and prepare us a decent meal," the dragon signaled to his svirfneblin cohorts. "Nothing is worse than a serious conversation on an empty stomach. There is blue-veined cheese with a white-mold rind, smoked rothe tongue, and a bottle of last year's Ulaver in these bags, among other delicacies. The dark ones might be as gentle and sentimental as hungry tarantulas, but they do enjoy good eating." "You are a fellow much to my liking," Omwo remarked cheerfully. "It's a pity we won't have time to know each other better. I find your attitude refreshing." "I wonder what the Reverend Sister will say if she finds out that you trade with the drow," I grumbled nonchalantly. "I bet that her idea of the behavior appropriate for the Guardian does not include dallying with the enemy." "Demin's imagination is rather shallow," Greenberyl replied as our small company made our way back to the camp. "There has always been a bit of trade going on between the drow merchant clans and the svirfneblin. It is the worst kept secret in the Underdark, yet both sides pretend full ignorance. Now that I have taken residence in the locale, I control the flow of goods, and keep my eye on the personages of the Ust-Natha smugglers. Half of them are informers, and not always for their own race; the other half will sell you their entire families, if the price is high enough. Having overstretched their resources for the Great Running that was nipped in a bud, the elites of Ust-Natha are in dire straits. It turned out that late Matron Mother Ardulace had been borrowing left and right to support her cause, and her untimely death nearly bankrupted the merchant houses that usually finance the nobles. Now there is an ongoing war between the Noble Houses, striving to grab the power of the fallen House Despana, and every one of them is strapped for cash. That makes the whole business of spying on them very entertaining." "Would not the drow be wary of selling information to you?" I asked him. "You must be a well known entity around here." "Naturally, I assume different personalities when I deal with them," Greenberyl chuckled happily. "A derro savant, seeking employment as an assassin, a duergar merchant, peddling a cache of second-hand weapons -- the possibilities are numerous. The dark ones have little sense of humor, so I am forced to enjoy this charade in private." He sniffed at the aromas already wafting from the direction of the newly built campfire. "Enough of this already, we should discuss the matter at hand over the course of our meal." For the next half an hour or so, I tried to raise the question that worried me most, but Greenberyl would have none of it. His attention switched between feeding Miamla the choicest tidbits of the drow delicacies, and questioning Omwo about the content of the halfling's future play. Omwo took to Greenberyl's teasing like duck to water, and the two of them continued to trade jokes, whilst I seethed in impatient anger. "Ah, the simple joys of the material world, " Greenberyl finally declared, sipping the luminous green liquor from a thimble sized silver cup. "I wish that solving your little problem was as easy as cutting a slice of cheese." He proceeded with the demonstration of his statement. "Alas, things turned out to be not that simple at all." He sighed, downing his tiny cup, and looked at it somewhat less cheerfully. My heart sank. "Are you telling me that despite all your bragging, you were unable to fulfill your part of the bargain?" "Not so fast, my dear chap. I have not finished my story yet. Let's just say that the payment that was asked for transportation of three passengers from this locale to the spot that lies directly under the forest of Silmista, did not make any sense to me. Your ring is valuable, but it is not that valuable. I could hire a Halruaan aerial fleet for what they ask for passage on that damned vessel. True enough, their way of travel is faster than anything you can experience around this place, but even so, they have to be reasonable. Still, even assuming that I could talk my contact down to a half of what he originally asked for, there is one major obstacle that needs to be overcome." "The location." Greenberyl picked another crumb of the sharp, blue-veined cheese, tossing it into his mouth. "Mm... you should really try this goody with Ulaver liqueur - the combination is delicious." He looked back at me with something of an apology in his eyes. "They refuse to move their ship outside of Ust-Natha's commercial dock to pick you up, citing all sort of nonsensical reasons. The real one being, of course, their reluctance of alienating the drow by being spotted at anchor so close to the city perimeter. Their vessel is quite unique in its build, and they need Ust-Natha as a market and a safe heaven in this corner of the Old Shanatar. The other big city on this side of the Lake of Radiant Mists, which is not allied with illithids, is Iltkazar, but our friends don't deal with the dwarves." "Does it mean the situation is hopeless?" "Once again, you are jumping to conclusions." Greenberyl wagged a finger at me. "I cannot bring the ship out of the city, but I can bring you to it. I have enough connections among the smugglers to attempt the deed, assuming that you will go alone." "If he goes anywhere alone, I will need to be on the ready." Omwo laughed sharply. "And I am not turning into a professional rescuer, unless he doubles my pay." "I did not know you were paid anything," Greenberyl blinked in surprise. "I am not," the halfling chuckled happily, "that is why I can safely ask for a double." "Are you done with your clowning yet?" I arched an eyebrow indicating my displeasure. "Then let me try to make sense of Greenberyl's proposition." "Honored One," I turned back to the dragon, "since I don't believe that you have planned this together with Demin to dispose of me in the most painful and humiliating fashion, I assume you must be joking. But your sense of humor is running thin. With all my poor understanding of the relationships between the Faerun races, even I can envisage what the dark ones will do to a surface elf, if they happen to catch one." "I was not planning to send you to Ust-Natha as you are," Greenberyl said in a hurt voice. "I suppose a skilled illusion can be crafted to disguise me as a crate of past-their-prime radishes, or an amphorae of rotting fish sauce. I have to point out however, that such magic is costly, and can be broken easily. Don't tell me the drow are foolish enough not to put wards on every entrance into their city." "They cannot ward Ust-Natha against all outsiders," the dragon replied quickly," or the alarms would be going off day and night. As every other drow settlement, Ust-Natha is teeming with all sorts of humanoids employed as laborers, mercenaries, or traders, not to mention the slaves and personal servants of the Great Houses. The surface elves are about the only race you will be hard pressed to find in the Foreign District. Yet there are always rumors of darthiir captives kept as translators or pleasure slaves. I do investigate these rumors and rescue the stragglers," he added proudly, "which is one of my reasons for be engaged in the surveillance of Ust-Natha." "But you are right in one aspect." Greenberyl scratched his beardless chin. "While struggling to recover her eggs, stolen by some rascal allied with the drow, my predecessor overindulged in illusionary magic." He gave Miamla a warm look. "I cannot blame her. Just look at our little beauty here, can you imagine her being sacrificed to a demon before she was even hatched?" "You are shifting away from the subject," I interrupted him, as the topic was making me feel rather uncomfortable. "In any case, in order to save her eggs, Adalon infiltrated the city with surface saboteurs, disguised as drow. That resulted in rather spectacular deaths of both Matron Mother Ardulace and her eldest daughter Phaere. After that, the Council of Matrons decreed that groups of mages with amulets of true vision should randomly patrol the city streets, dispelling illusions." "That is exactly the way I would have done it, if I had been put in charge," I nodded in satisfaction. "A significant risk of being caught will discourage the cautious; the brave and foolish ones are less of a threat. But this makes your proposition of smuggling me into Ust-Natha even less plausible." "On the contrary, you are the only one who can try such a diversion without much risk." Greenberyl replied. "You body type, and hair color is a perfect match. So what if you are a little tall for a drow male? They breed like vermin, and occasionally come in larger sizes. Same goes for the eye color: it is a common myth that there ain't no drow without crimson eyes. I have seen ones with irises yellow as gold, and purple as amethyst. The blue-eyed dark elves are rarity, but they happen all the same." "I want to point out once again," I said acerbically," that my skin tone is a dead give away." "For that, I have a solution: simple as pie and elegant as pastry, but without the disadvantage of a flaky crust," the dragon grinned rakishly, showing a mouthful of sharp, pointy teeth. "This is a vial of the Oil of Darkening." He pulled out a small bottle of liquid that looked rather like ordinary ink. I could only gape at him with an expression of utter disgust, mixed with admiration at his audacity. "Strictly speaking, this is simply a solution of psionic squid ink in a base of mandrake oil, and some other, rarer additives," Greenberyl went on with his explanation, ignoring my bewildered stares. "Mixed and enhanced with a teensy-weensy bit of enchantment magic, to make penetration of the pigment deeper and more uniform. A scoop of this salve will turn you into a perfect drow in a matter of minutes. The pigment is water-proof and virtually permanent, until exposed to direct sunlight. It will stay on for weeks after a single application, yet will dissolve in minutes under the sun." "Now, you sound like a professional salesman," Omwo shook his head in amusement. "Would it not be detectable by magical means, though, same as regular illusions?" "It will not be detected as easily, since the traces of magic in it are very weak. This oil is actually quite popular among the explorers of the Underdark and even some surface rogues," the dragon continued his pitch. "Makes blending into shadows easy, keeps your body heat radiation to a minimum, and suppresses the perspiration. Triple benefit for the price of one." "You would be the last creature I would suspect of peddling the snake-oil potions to gullible fools!" I scowled at him. "I am not buying this perverse rationalization of yours. I will never pass for a drow, even with the skin darkened with this vile concoction. Besides, I don't speak the language." "My friend, you are looking for excuses." Greenberyl admonished me gently. "But believe me; you simply have no other choice. Time is running out for you, and taking the githyanki ship to Gatcharof is your only hope of reaching the Forest of Shilmista within a few days. Add a few more days for finding and activating a portal to Evereska, and your quest is done. I have brought you a full set of drow wizard robes, complete with plain, but decent quality piwafwi. And I will throw in an earring of drow-speech, if you promise to return it once you are done with your quest. I collect such trinkets, but this one is not as rare as the dragon-tongue ring that I traded from you." took all of Omwo's skill with a needle, and numerous alteration cantrips, to make my new outfit presentable. The previous owner of the robes was shorter and narrower in the chest, and, in all probability, had met with a violent end. Still, after we had finished mending the suspicious-looking gashes on the back, adjusted the length of the hem, and loosened the armpit seams, the garment fit me well enough. It was even elegant, in its own creepy way: the silky dark satin was slashed with purple velvet, and decorated with rows of spiders done in red silk. It also possessed numerous inner pockets and hidden compartments. The wide sash of padded black silk, a pair of soft snakeskin boots, and the dark hooded cloak, woven from some extremely pliable material, completed the outfit. Yet all of that splendor brought me no joy. The never-ending masquerade, in which I had been engaged for the past three months, began to grind on my nerves. It seemed I had been changing clothes and personalities more often than a professional mummer, yet all that scheming and switching of faces had brought me nowhere. After Demin's disastrous intervention, I had lost faith in the successful outcome of my mission; and it had not been that strong to begin with. Now I was beginning to lose patience as well. The Seldarine had made me their plaything, as I was driven forward not by my free will, but by the winds of fate blowing into my sails. - Would you rather go back to being the plaything of demons? Irenicus's crazy whisper surfaced in my mind. - I can assure you, you would like it even less. Tanar'ri are as casual and inventive about causing pain, as you are about finding excuses not to complete your quest. I had no desire to get into an argument with him. Ever since we had bonded with the 'Kiira stone, my alter ego had been extremely helpful and cooperative, and I was getting used to his continuous presence at the edge of my awareness. Together, we had managed to unravel some of the spells that protected the lore crystal. We could not access its most important content, as the inner core of the Selu'Kiira was guarded by even more impressive tangle of magical wards, removing which required something more than the ingenious mind of a powerful mage. But at least we had been able to trigger the enchantments that allowed the stone to be magically concealed from prying eyes of the outsiders, and unlock its storage abilities. The ease with which the newly-stored spells could be retrieved from the crystal's outer layers was impressive, but Irenicus's fascination with the stone's powers, and his obsession with his lost connection to the Elven Spirit were lost on me. He went on and on, rambling about the Spirit of Arvandor and its link with Elven High magic, but all I could think of were Demin's parting words. "You don't belong in a company of conscientious, caring friends because the ones who get close to you, end up badly hurt or dead." Was I truly cursed to damage everything and everybody in my path? At first, I had dismissed her implications as lies, but after Omwo's had retold me the entire story of Mirriam's misfortune, I could not continue that denial. I despised Irenicus's bitterness, but was I any better than him in handling my few precious allies? Miamla was angry at me for leaving her behind. Omwo appeared much better at handling his emotions, but I sensed disappointment behind his cheerful facade. I convinced myself that both of them were better off without me, and yet, could not but wonder if the Seldarine were testing me in this manner. Was I supposed to find a way to appease them by taking them along? And then, there was the problem that caused me the most discomfort. After parting ways with Saemon's children, there was certain emptiness in my chest that was hard to fill. I could not properly describe the emotion that arose whenever I recalled the twins' antics, but thinking of the girl in particular, caused the queasy, aching feeling that could almost be taken for an admission of guilt. Mirriam was old enough to be fully responsible for her actions, and I had never caused her any physical harm, yet the feeling was there, and I could not get rid of it after any amount of mental exercise. Almost nostalgically, I recalled that intoxicating feeling of freedom from any bond or obligation that I had experienced back in Amkethran. There was a price for everything in this world, it seemed. I was no longer haunted by bloodcurdling nightmares, and my magic abilities had recovered to great extent, but the Elven Gods had saddled me with the quest that I did not care to complete, and my former kinsmen, whose pain I could neither share nor alleviate, pursued me with their desire for revenge. If that was not enough of a bother, I kept worrying about the fate of a human maiden, whose only distinctive attributes were hot temper and sweet lips, good for kissing. I sighed at the unfairness of it all, and went on with my preparations. The most important part of my disguise worked exactly as Greenberyl had described. There was no need to undress and apply the potion on every part of my body. Uncorking the oil, and daubing a few droplets on my wrists produced a truly amazing result: the blue-black color spread over my skin like wildfire over a field of dry grass. Afterwards, I looked in the hand mirror and averted my eyes. The face that stared back at me was rather striking, but it looked intemperate, and more acute, as if the change in coloration had highlighted the sharper, greedier aspects of my personality. Accentuated by the pale eyebrows, my eyes stood out too brightly on the dark background of my face, giving me the hungry, desperate look that I liked not at all. Next I went through the sparse collection of magical items and ingredients in my possession, sorting the most useful into the various compartments of my new robes, and consigning the rest to the recesses of the extravagant looking backpack, provided by the same supplier as the robes. I placed a spare change of small-clothes, and the nondescript coat meant for the surface world, into the backpack; then slipped the obsidian earring of drow speech into my freshly pierced earlobe. On my belt, went the sheath with the enchanted blade of the Fiery Sleeper that Omwo had carried all the way from Darromar. While investigating the pockets of my old clothes, my hand chanced upon something sharp and pointy. I cussed, sucking at the prickled finger, and pulled the object out, wondering if it was some 'clever' practical joke played out by one of my companions: the wyrmling was extremely upset about our change of plans, and had refused to talk to me ever since it had became clear that my departure to Ust-Natha was imminent. I removed the silk kerchief, wrapped loosely around a small object, and paused. The blue stones of Corellon's crescent shone at me from the humble wrapping. This was not an item one could forget about lightly. The fact that I almost had made me feel tense. I frowned, recalling all the memories associated with the brooch. This was the last link that connected me to water elemental and her hidden oasis. I had taken it from her mindlessly, considering it to be no more than a fancy trinket. Adalon had been the first to recognize the piece as Corellon's personal insignia. Omwo claimed that the crescent had led him to me, urging him to hurry in the hour of my most desperate need. Carrying the thing in my pocket made me feel like a supplicant, tied to his benefactor by an invisible bond. I could not stand the humiliation: no one could put a leash on me and expect me to be grateful for the safety granted by the arrangement. I could not simply throw the thing away; angering my celestial patron was not the smartest idea. Taking it within the walls of Ust-Natha was similarly out of the question: the risk of exposure was too high. Undecided, I mulled over the brooch, turning it in my hands, until the solution came to me, plain as day. "I can only promise that I'll do my best to locate them," Omwo said solemnly. "But you have to realize that Saemon can be half the world away by the time I reach Darromar. Besides, there is no guarantee that he did not send the twins away. He is keeping company with rather... unpleasant characters. I doubt he would want to expose his children to those creatures." "Of course his contacts would be of the unsavory type! He is a pirate and a smuggler," I shrugged off the halfling's nonsensical superstitions. "Would you expect him to limit his contacts to the order of noble virgins?" "It certainly would be a problem for his business if he did," Omwo sighed "But given all his savviness, and outward glamor, Saemon's ring of associates does not have to include a vampire." "Now you are talking nonsense," I complained bitterly. "I thought you wanted me to let the girl know that I forgive her silly escapade. There is no need to invent excuses if you do not wish to go." "Honestly, mageling, sometimes I wonder if the biggest mistake of my life was following that poor creature into the sands of Great Calim desert! You are treating me no better than my former mistress, even though I stick with you to the end, all for the sake of good old times." After that outburst, I had the decency to pretend to feel remorse. Listening to my cleverly worded reassurances, Omwo yielded, and agreed to do as I bade, under the condition that I would send a word from Evereska, notifying them of my safe arrival. The letter was to be addressed to master Demadan E’resse in the Elfstone Tavern of Waterdeep. Miamla remained stubbornly silent until the end. There was nothing I could do to soften her or make her part ways with me on better terms. At least she was staying in character – she had acted the same way when I had left her behind in the village of Perch. The bright halo of her silver hair was the last thing I saw on the distant shore as the small boat slipped through the murky waters of the nameless lake, heading towards the narrow tunnel that led into the Ust-Natha water system. There is something to be said about the effect of drow architecture on the surface dweller, unaccustomed to such sights. My first impression of Ust-Natha was astonishment at the sheer malice emanating from the city, mixed with awe at its absolute propriety for its environment. Perhaps, my fascination was the result of the hours spent lurking inside the foul-smelling, moldy tunnels that twisted in and out of low-ceilinged reservoirs, split onto even smaller sections with rock falls and debris. At times I was forced to lie flat at the bottom of the boat, squeezing my tall frame into the little space left by the two svirfneblin guides. Not surprisingly, when the boat had finally slipped out of the last fetid rat-hole, and glided noiselessly into an open space of a huge cavern that shone with thousands of soft, multicolored lights, I was stunned. There was wicked harmony in the mad tangle of bridges that connected the forest of drilled out stalagmites and stalactites into a multi-tiered system, all at the height of many-stored buildings. On the North and West sides, many of the bases of the Ust-Natha's perverse 'trees' stood knee-deep in the waters of the slow underground stream that snaked through the cavern, giving it the look of a stone mangrove glade. To the East and South, the cavern's floor rose steeply, giving ground to a menacing-looking wall, behind which lurked even mightier structures and more elaborate mansions, carved into shapes that resembled half-sheathed weapons, insect mandibles, and spiraling tentacles of a giant squid. All that splendor would have been hidden by the ever-lasting darkness, if not for the multitude of lamps, lanterns, and braziers, nested in every accessible niche of every structure. Yet, in the face of all that suppressed madness imprinted into stone, one could not deny the beauty of the strange shapes, chosen to define the character of the dwellings. 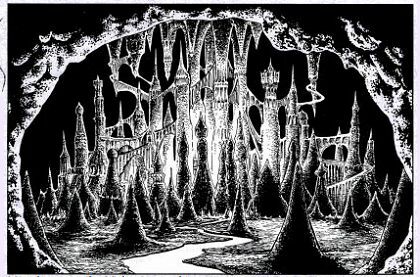 Amazingly, on some level the drow city reminded me of its surface twin that was built amongst the branches of real trees, and similarly interwoven with arching walkways. I had only seen Suldanessellar in a dream laced with sorrow, but my lack of the detailed memories of her was compensated for with the sharpness of the image. The boat sneaked along the side of the cavern filled with water, hiding in the shadows of the overhanging stalactites, until finally my svirfneblin guides poled it into a shallow mere, overgrown with fluorescent moss and water-grass, and stinking with some organic refuse. At first glance, I took the huge round shapes lurking among the algae for a set of rounded boulders, until one of them suddenly snorted out an explosion of air bubbles and the huge horned head of a hairy beast popped out of the water, still chewing on its luminescent cud. But before I could comprehend the implications of sailing into the midst of a feeding rothe herd, a kayak even smaller than our boat lurched from its hiding place. Its single occupant waved a scaly paw, pointing forward, then accelerated his rowing, leading us towards a stony islet hidden among the thicker clumps of vegetation at the very center of the lagoon. Evidently, that was as far as my svirfneblin guides were supposed to go. Acting as swiftly as possible, the deep gnomes helped me to scramble out of the boat and handed me over my backpack and staff. Their mission complete, they took off immediately, leaving me in the care of a small lizard-like creature that rode the kayak. My new guide bobbed his scaly head up and down in a semblance of a curtsy, his eyes continuously shifting away, as if he was afraid to meet mine. He wore nondescript brown rags, but from his scrawny neck dangled a small copper chain with an amulet that looked like a regular gray pebble with a hole drilled through its center. Suddenly remembering Greenberyl's directions, I pulled out a similar pebble, demonstrating it to the frightened kobold. His fears of mishap alleviated, the creature nodded most vigorously, sighing with relief. "Tzaur," the kobold spoke in harshly accented Common pointing at his scrawny chest with a clawed finger, "takes you to the Boss as was promised. Boss will sneak you through the Ranchmen Gate and into the city. But first we wait for the ferry." "You can call me master Jevan," I replied in the same language, hoping that my lack of any accent will pass for an outsider's flair. "Why can't you drive me to the Boss in your kayak?" I hoped for a smooth and quick transition from one locale to another and the idea of mingling with the local folk made me nervous. "Tzaur's boat too small for the big master," the kobold explained simply as he led me towards the more rocky, side of the islet . "Want to feed the pike in Ssaniar'haanin, Tzaur does not." The silver-and-obsidian earring dangling in my ear made me understand the drow name for the river, it meant – literally – the Serpent Stream. I wondered if it was connected in any way to the Sulduskon that flowed through this corner on the Forest of Tethyr. "Boss trusts Tzaur to placate the rothe-herders, so they avert their eyes from the ones who come and go in and out of the city through the Ssaniar'haanin." Tzaur continued his chattering. "But not many drow-masters come this way. Usually the small folk like Tzaur and Ussgolhyrr do. Tzaur wonders why master Jevan wanted to come the small folk way?" I smirked privately at the name that Greenberyl had adapted for himself, wondering what was his current disguise, and if the kobold had any idea how bulky his partner in crime really was. "Master comes from Menzoberranzan on a trade mission." I said neutrally, following the short story we had concocted together with Greenberyl. "Masters of Bregan D'aerthe are looking for the fairy-made artifacts of power. They heard Ust-Natha's Bazaar has some interesting items. Master Jevan wants to shop around without giving anybody a hint of the true price he is willing to pay for such things." "The big master is not very smart," the kobold chirruped his disapproval, "Ust-Natha is broke as the drow-masters Houses are fighting each other for power. Many merchants have fled and the trade on the Bazaar is going at snail-pace." "The drow-masters Houses are always fighting." I sneered dismissively. "It is in their nature to fight. There are bargains to be made in the city while it is short on gold." "The big master knows better, perhaps. Yes, no?" The kobold stopped at the entrance to the smoke-filled opening between the two tilted rocks, that provided a sort of a roof over a camping site. "Now the big master waits while Tzaur talks and pays coppers to the rothe-herders, so they let us sail on the next ferry to Ust-Natha,"
The variety of creatures dwelling in the grotto too shallow to be called a proper cave, could have stunned an adventurer much more experienced than I. A few were little reptilian kobolds, of the same race as my companion. Unlike him, they wore nothing but loincloths of cured rothe skin; their weapons consisted of long sharpened sticks and rusty knives. A number of starved goblins lurked in the deeper shadows around the fire. There were even two skinny orcs, and a lame bugbear in a rotten shirt of studded leather, all looking downcast and destitute. Tzaur went straight to the big creature, who appeared to be in charge of the camp and after a few sharp chirrups in some unknown language we were given permission to take the ferry that would make its way across the lagoons and sounds of the Serpent Stream picking up agricultural produce and delivering goods to the ranchmen. Elf-gates - in Myth Drannor's golden era, sister settlements in the High Forest, the Yuirwood, Shilmista, the Moonwoods, and other forests farther south embraced the peace and magic of Myth Drannor's unity. Other previously established settlements such as Silverymoon also grabbed hold of the dream and linked their fates and magic to that of the City of Song in Cormanthyr. Contact was even reestablished with long-isolated Evereska. By the early sixth century, the Coronal and the High Mages secretly (and later publicly) established gates to link these many places with their spiritual and magical home in Myth Drannor. Most were controlled gates, their use contingent on connections within both cities. Many others, including those to Silverymoon, the High Forest, Shilmista, and the Yuirwood, were relatively public gates and required small fees of users who would travel from one city of wonders to another. Piwafwi - is a drow word meaning cloak. Also, a (lesser or common) Piwafwi is an ordinary-looking drow dark woven magical cloak. When the hood is drawn over the head, the wearer becomes almost invisible normal sight, akin to an invisibility spell, and infravision, thanks to the heat-shielding properties of the cloak. The drow use these cloaks to stay out of sight in the Underdark. They are fashioned from spider silk and other unknown fibres and it is common for the wearer's house symbol to be included on the cloak. As with drow possessions in general, it is very rare for other races to have Piwafwis due to the xenophobic and protective nature of drow society. Like many other drow items, direct sunlight will destroy a Piwafwi, rendering it useless after two weeks of exposure. Ulaver - luminous green drow wine. Old Shanatar - extending for hundreds of miles beneath Amn, Tethyr, and Calimshan, Old Shanatar was once home to the powerful dwarven realm of Deep Shanatar. Only one of Deep Shanatar’s eight kingdoms still stands today; the others have fallen to drow, mindflayers, and duergar. Gatchorof - amid the ruins of the ancient dwarven realm of Torglor, the githyanki have established a military encampment on the Material Plane. From the outpost known as Gatchorof, githyanki raiders make frequent forays into the Lowerdark to strike against the illithids of Oryndoll, their thralls, and anyone else who gets in the way. Drow Agriculture - staple crops are fungi, edible mosses, and lichens. The drow farm fungi grown in fields nourished by the combined waste products of their cities, both dung and the dead are carted out to provide a basis for the mushrooms and mosses to be grown. Humanoid slave shepherds herd deep rothe which also subsist on the Underdark lichens and mushrooms. Rothe manure and waste products are also used to provide material to grow more mushrooms and lichens.